As much as I don’t miss large swaths of life in China, I do look longingly at kongfz.com, the world’s best secondhand book website, and remember with pleasure being able to purchase a lot of sources and other bits of historical detritus with a minimum of effort. These days, getting ahold of things that catch my intellectual fancy requires contacting several friends, a good bit of guilt on my part for imposing, a wait of months, shuffling money in between international bank accounts, etc. And in addition to online book shopping, there’s a lot of other places to buy secondhand books and other types of sources – places like flea markets (which have proven to be a real boon for a number of PRC historians – documents that seem like they ought to be in an archive, and sometimes were previously in the hands of work units or other official places, sometimes show up) and book fairs. In Shanghai, the Confucian temple – Wen Miao 文庙 – is a beautiful, tranquil gem in the middle of an enormous, bustling city; it also happens to host a nice book fair each week. The sellers, spreading out on tables and on blankets, have everything – from foreign language books, to text books, to expensive coffee table art books, to generic publications of a more recent vintage, to old things of many types. 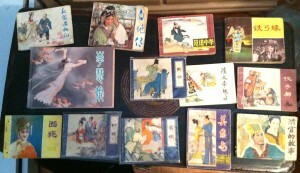 In addition to owning a lot of 1950s and 1960s publications of various stripes, I have a small collection of lianhuanhua 连环画, picture storybooks, or comic books (though they’re a different format than the ones commonly seen in the West). They are readily available, and at the Wen Miao, several sellers had heaps and heaps of them every time I went. They tend to be cheap – with a few exceptions, Cultural Revolution-era ones being rather desirable and thus, more expensive – and tiny, and come in a pretty diverse variety of topics. I collect ones related to opera, of which there are a great many. Some of them are actually quite beautifully done – I have a few versions of Li Huiniang 李慧娘, one in particular has drawings that are lovely and evocative. 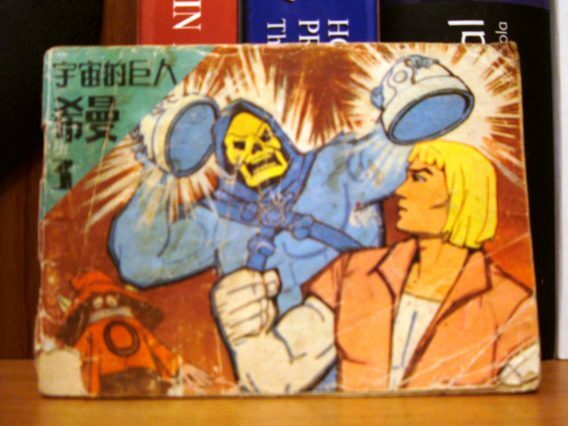 Sometimes, popular movies would receive the lianhuanhua treatment, with the text illustrated by movie stills. These I find much less interesting than their drawn companions, but does indicate something about the relative reach of certain kinds of films. They don’t really have anything to do with my research, but it’s interesting to see how different stories have been interpreted, which stories have been popular over the years, and so on. I don’t go out of my way to acquire them (unless they are related specifically to one of the few plays I pay a lot of attention to), but at the Wen Miao, it was easy to buy them by the handful. Once, a seller who queried me about what I was looking for in somewhat halting English reacted with surprise when I responded in Chinese that I was looking for opera lianhuanhua, especially anything with ghosts. He dragged a few things out (most of which I bought), then pointed to another one, which was neither opera nor ghost related. It was Star Wars. 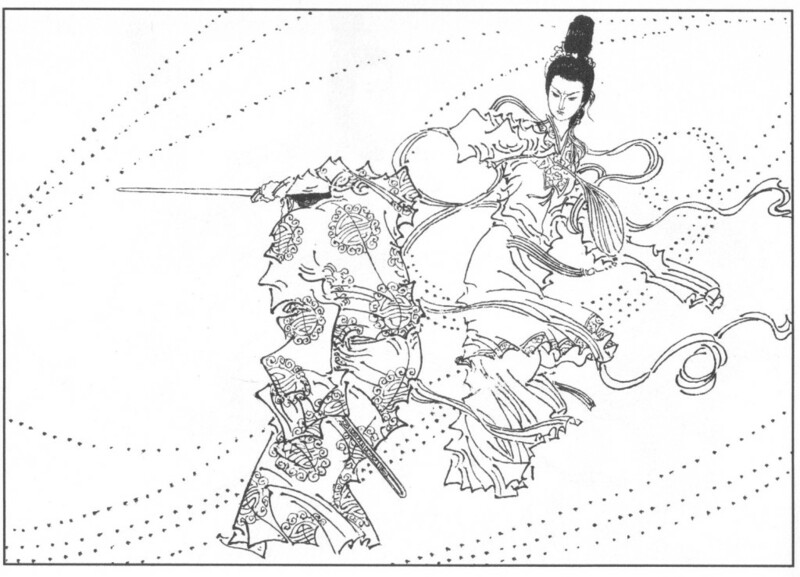 In lianhuanhua form. From 1980. It was simply so incongruous I couldn’t leave it behind. It also cost about a dollar (which is one reason I’m not terribly discerning with what lianhuanhua I pick up on whims!). I’m always very interested in how culture circulates and changes through time and space – although my current research focuses on culture being reiterated and refashioned over time, more simultaneous instances are also of great interest to me (if not quite an issue with 16th c. Chinese ghost plays). I suppose one of the defining features of modern Chinese cultural production (or perceptions of it, at least) is rather rampant IP violations. 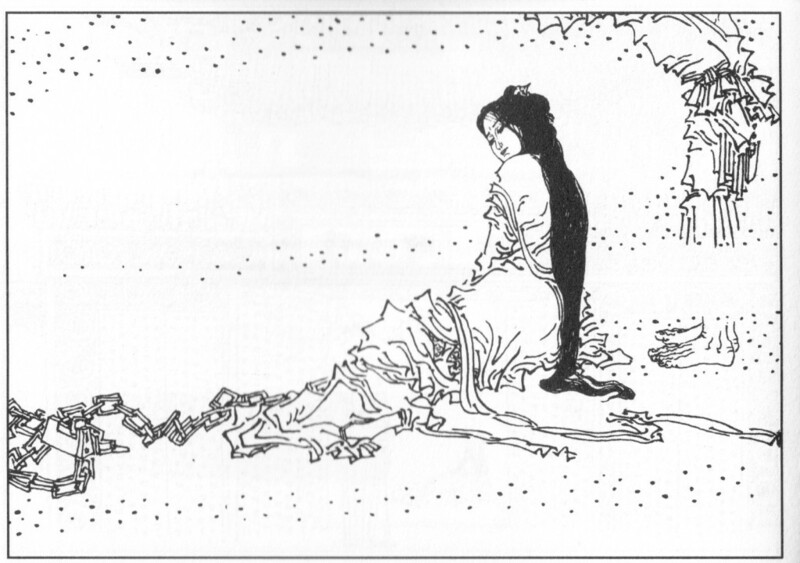 But at the same time people are amazed by the speed with which Chinese pirates hop on all sorts of (re)production, I think we often forget how quickly culture circulated before the internet. My students, for instance, are often surprised to discover how hip audiences in Shanghai were to Western films in the 1920s and 1930s, or music; and how these things flowed back and forth across the Pacific. Considering the delay in getting from point A to point B in an era where air travel – never mind the internet – was not the primary way of moving people and goods, it’s really pretty impressive. 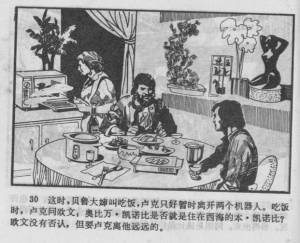 So it shouldn’t be a surprise that in 1980, an enterprising press in Guangzhou put together a lianhuanhua of a popular Western movie – one that had come out three years before in the US, and a year after that in Hong Kong (my guess as to where the “libretto” and stills, etc. came from: it seems pretty obvious from the drawings that the artists weren’t always working from an actual film, or really much at all). But we’re very accustomed to thinking of China at this point-or-slightly-before as being so very cut off from outside influences. And it’s true to some degree, the Cultural Revolution had just ended in 1976, shortly after Mao’s death, and China was culturally isolated (from Hollywood, at least) in a way it hadn’t been in, say, the 1930s. So I admit that Star Wars popping up amidst the classical tales and stories of brave revolutionaries did surprise me a little bit, and I’m supposed to know better! But one presumes this wasn’t exactly the sort of thing Deng Xiaoping was really gunning for with reform and opening (gaige kaifang 改革开放). 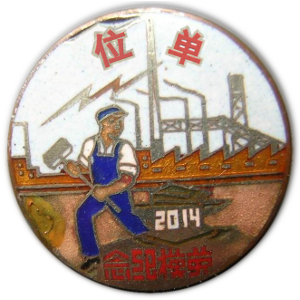 As a further update, some people have dug up other Chinese versions, linked to in this lengthy forum post. It looks like this 1980 version is pretty competent artistically, all things considered! 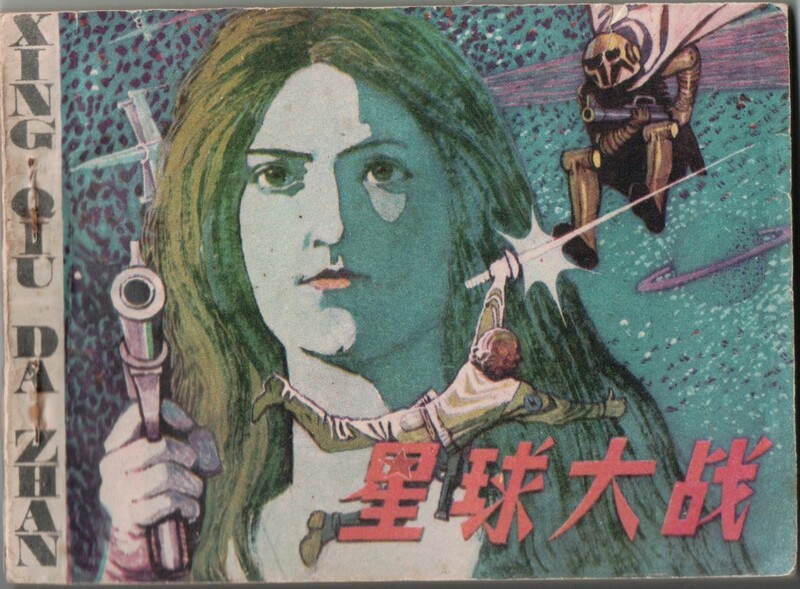 Susan Fernsebner, a fellow Chinese historian, put up some related musings on vintage science fiction covers. Jeremy Blum of the South China Morning Post also did an article on lianhuanhua – this one in particular. We’re also on io9! … And the Hollywood Reporter. And Rolling Stone. And the BBC. And a lot of other places, including (paper) newspapers! 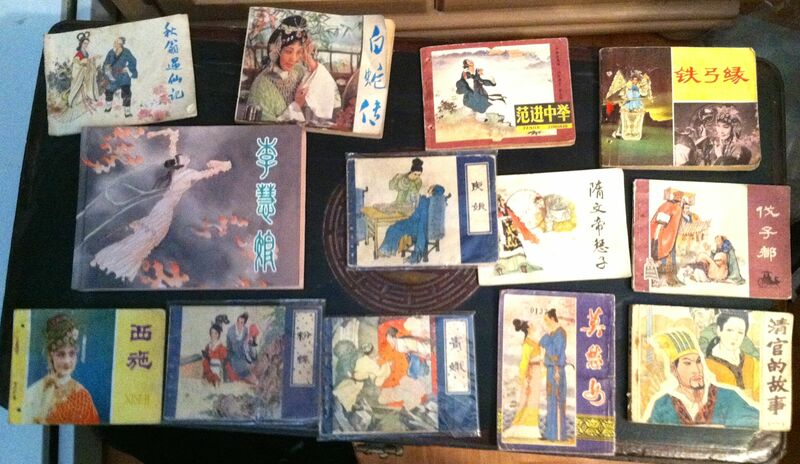 Who knew a humble shanghai Chinese comic book would get so much attention? And rode a rocket firing Harley! Some of the art in this is quite good — the style reminds me of the interior art in 1960s/70s SF magazines like _Analog_ or _F&SF_. It’s pretty consistent in drawing style, but the character and scenery designs change so much from one page to another (especially Chewie!) that it seems they must have had multiple artists working simultaneously. Sue Fernsebner had a post (link above) musing on vintage scifi covers & the art style. 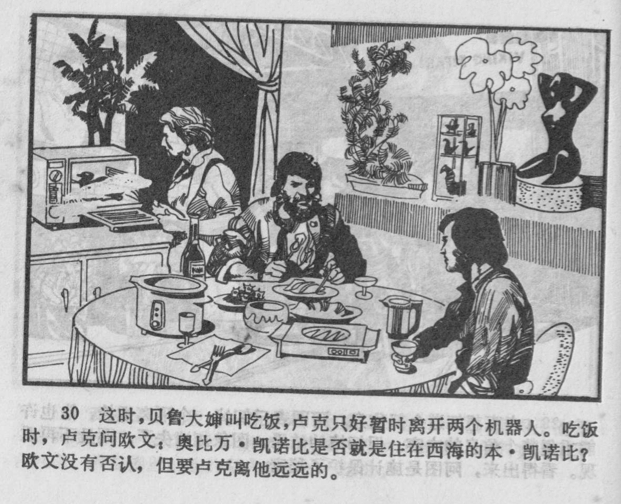 I was always more into the Tintin’s myself (had a full chinese set- 44 books), but I do have a bunch of other random early 80’s / late 70’s 小人书 lying about my apt in Shanghai. Mostly from chenghuamiao, but I did like the old book market down south bund area, (near fuxing lu), now sadly gone (not wenmiao, but close-ish). You still see people selling these on the weekends down by the backstreets of qiujiang lu. Taobao is full of them in much better condition though, and for much better pricing. I’m a kongfz girl (I still get at least one big order – through begging and pleading – a year), never got into Taobao (probably good for my bank account!). The opera 连环画 I got at Wen Miao are actually in very good shape, all told, but I’m not terribly picky – they were just little, fun things that didn’t take up much room. Anyone else notice Chewbacca’s strong resemblance to the Monkey King? As someone who was spurred into learning Chinese and going to college for an East Asian Studies degree after finding some Biohazard/Resident Evil manhua, I thank you for sharing this. I’m always fascinated by pop culture reinterpretations and how much they differ from the source material. This is simply wonderful. Thanks for sharing these. I think I may have seen some version of these things when I was a child for the Monkey King but not Star Wars. Thanks so much – this is amazing. Off-model early Star Wars stuff like this (okay, this is as off-model as it gets!) really floats my boat. You made my day. Great article and I’m in awe by this historical find. 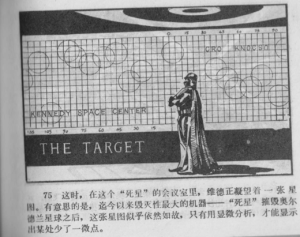 By any chance do you know the name of the press in Guangzhou that published this Star Wars lianhuanhua ? That is awesome! I love of the web works. I’m a lianhuanhua fan, I even interviewed the famous author He Youzhi once, but I had no idea this ever existed. Thanks a lot. Hang on, visually, some of this is based on Empire Strikes Back which came out in 1980. I was thinking about this: they got the narrative from someone who apparently traveled outside China (could be a diplomat’s son in Europe, or a lucky cadre crossing the border frequently), saw the movie (on a limited budget, but might have to watch thrice) and tried to get the basic storyline down to its basics while watching. From ideas they could take from the traveler’s narrative, the artists, with dozens upon dozens of stock art and pictures cut and taken out of trade brochures and foreign magazines left at some hotel, sat down and began drawing their own take of the Star Wars universe. Hmmm… At least one frame seem to have come from the first Star Trek movie, the scene at the shuttle bay at Frisco. Thank you. All that was mind-blowing. Alternately – it was out in Hong Kong in 79. Plenty of people saw it, and I’m sure copies made their way to the mainland. Cinema doesn’t end at the border! I wonder if the artist(s) had a toy catalog as reference, at least of the action figures. Several of the characters, especially some of the robots and Bobba Fett did not appear in the first movie. It would also explain why they got the look of the characters right, but missed so badly on the vehicles: there simply had not been toys based on them put into production yet. I agree with the other comments regarding source material for the artwork. A lot of the images are very familiar from publicity photos for Star Wars, Empire Strikes Back, and other works. Where the images look somewhat like the designs (and actors) in the movie, you can be sure it closely mimics a widely available publicity photo. It’s interesting how fairly accurate the story is (based on the linked translation) – clearly whoever wrote it did see the movie, even if the artist didn’t. The incongruity between the art that’s based on promo art/stills and the other drawings is pretty interesting/funny, though. So this is a story of a rebel faction (written as 造反者, no less) fighting against the tyranny of a great empire, and it was just so casually published in China back then? I find this rather interesting. Yeah, it is interesting. When I saw that they’d drawn the rebel ship as a Soyuz spacecraft, I figured they were going to go in the direction of telling Star Wars as, like, the Peoples Rebel Alliance’s heroic fight against the capitalist Galactic Empire, but it doesn’t seem like they did that. You didn’t realize… Leia dresses as a bullfighter! I’m spanish, I’ve recognised it inmediately. She wears a “traje de luces”. Following the second paragraph of this post, you put up two drawings that are absolutely GORGEOUS!!! I would love to see more from that particular story/ publication. Do you recall the title? Have you posted it somewhere, or know where I can find it? I would happily pay for scans if you have any. Please let me know. Thanks! Those are from the 1982 Li Huiniang (李慧娘) lianhuanhua. I don’t believe the full copy is online anywhere, but if you Google “李慧娘连环画” & hit the ‘images’ tab, you should be able to see more scans from the same version, among others. They are very beautiful, aren’t they? My favorite lianhuanhua by far. ETA: Just kidding. The whole thing can be found here. This is a reply from a Chinese student in China. 《Rogue One: A Star Wars Story》 was released in China mainland on January 6th. I’ve watched this movie twice in cinema already. When I was typing a movie comment last night, it reminded me of the Star Wars comic books(or lianhuanhua) which I’ve read when I was a child(about 20+ years ago). However, I’ve lost them. So I searched relevant information on Internet, and it leaded me to this webpage. I’m still researching these lianhuanhua, especially related to Star Wars. So, I can offer some help if necessary. Thank you for your reading. My contact information is 2313574812@qq.com(email address).